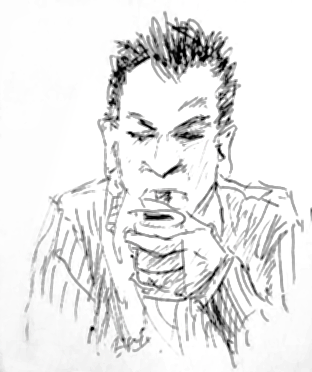 The Significant Other, sketched… not sure where. I think she captured the quiet tormented despair in my eyes quite well. A student. She was, I think, 12 or 13 at the time. This picture is recognisable as her, but she is more beautiful than I’ve drawn her. and to be honest I think she captured her own likeness better than I did. A portrait of Elberry, drawn in an Italian pub in Vienna.